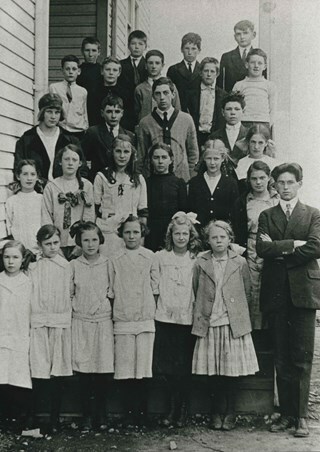 Photograph of Inman Avenue School class. 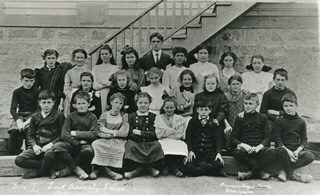 Marjorie Cassidy is in the 2nd row, 4th from left. The teacher, to the right, is Mr. Lowther. The Cassidy children, from oldest, are Willie, Marjorie, Mary and Katie. 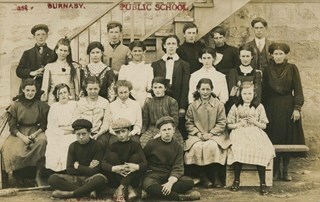 Photograph of a postcard of East Burnaby (Edmonds Street) School, Division I class. The school was once known as Douglas Road school, the first in Burnaby, opened 1894. Identified: (3rd row, 5th from left) Esther Love. Teacher: probably Mr. Lowther. Annotation on bottom of photograph reads, "Div. I. East Burnaby School. 1910"